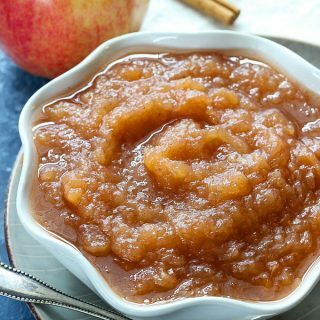 Crockpot Cinnamon Applesauce – homemade applesauce is super easy to make in your slow cooker, and only requires four simple ingredients! 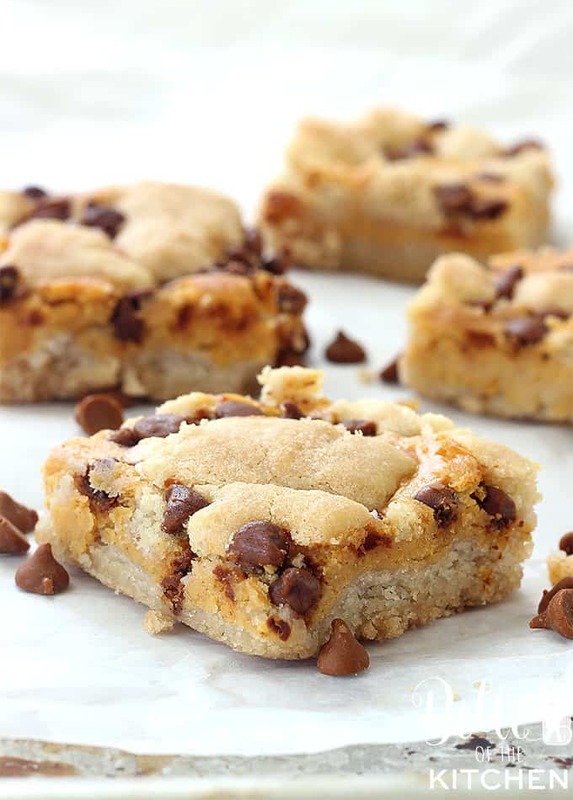 This is the perfect snack or treat, and tastes amazing when it’s warm! Today’s recipe is coming to you by request of my five year old, thanks to all of the fun apple activities she’s been doing the past couple of weeks in Kindergarten. Last week her class made applesauce, and she loved it so much she came home begging for us to do the same. So this weekend, that’s just what we did! It’s been a long time since I’ve made homemade applesauce, and after making it this past Saturday, I can’t believe I’ve waited so long make it again! In fact, the last time I remember making crockpot applesauce was when I was teaching my own kinder class about six years ago! I’m pretty sure I’ve made it at some point since then, but let me tell you this; my house smelled amazing on Saturday, and eating a bowl of this yummy cinnamon-y apple goodness was such a treat! 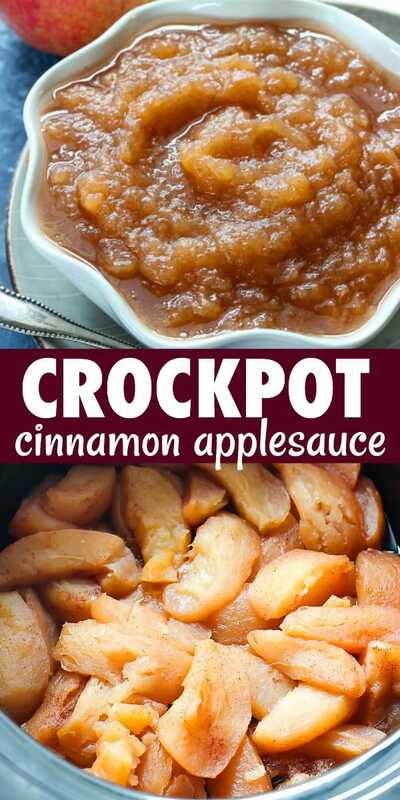 I’m definitely going to be making this crockpot cinnamon applesauce a lot more often now! 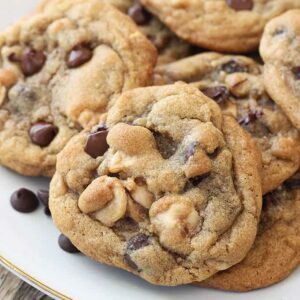 This recipe is crazy easy, too. You just stir everything together and then let the magic happen. When it’s all done cooking, I just stir mine up with a wire whisk or spoon. 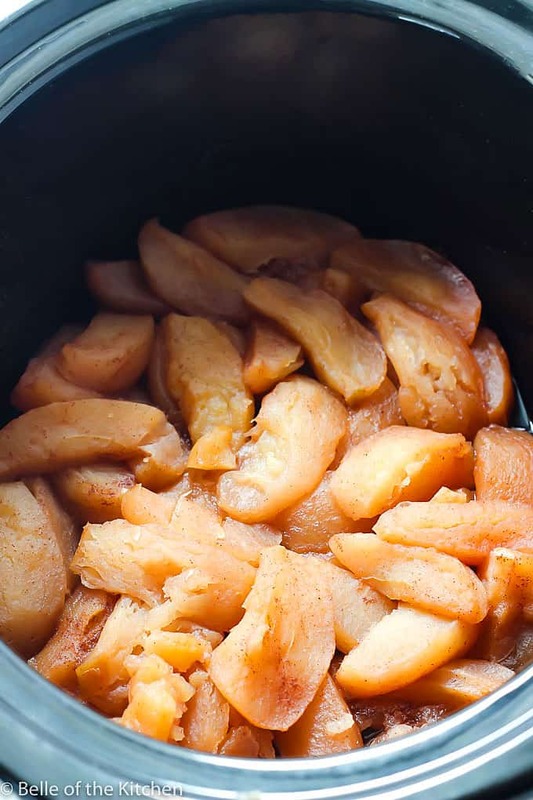 The apples fall apart easily and you’re left with a crockpot full of sweet and delicious homemade applesauce! Oh, and this tastes AMAZING warm! I highly recommend eating it that way (though not steaming hot), but you can also let it cool and store in the refrigerator for later. This crockpot applesauce makes about 6 servings around 1/2 cup each, which is perfect for our family to eat over a few days time. 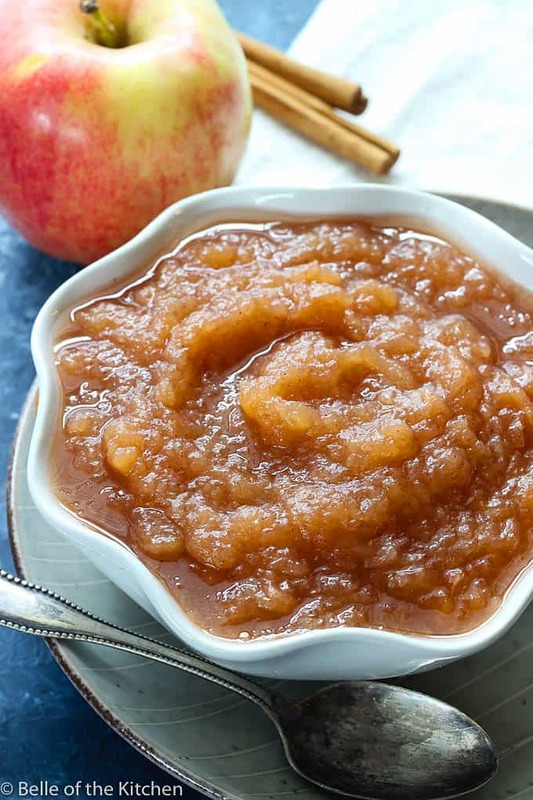 You can definitely double this recipe if you’d like to make more applesauce, though! Place the peeled, sliced apples into the bowl of your crockpot. Sprinkle the sugar and cinnamon over the apples and mix well. Pour the water into the crockpot and place the lid on top. Cook over high heat for four hours. When cooking time is up, remove the lid and mix the apples using a wire whisk, stirring until smooth, or until desired consistency is reached. This applesauce tastes delicious warm! To store, allow the applesauce to cool completely then place in a sealed container in the fridge. Enjoy! I love applesauce! 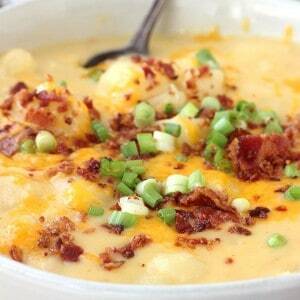 Looks so delicious and perfect for brunch! I also haven’t made applesauce for yonks! You have inspired me to make some. Love the addition of cinnamon! I love apple sauce it goes with so many things, I normally pick wild apples in autumn so will sure use this recipe! We often make a batch of something similar to add to porridge and on toast for our toddler. 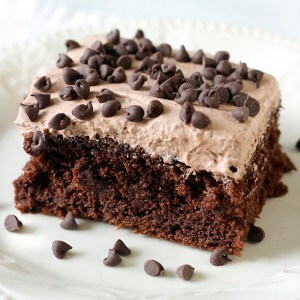 Your recipe looks and sounds so delicious I want to make it right now, I like to add a little sugar to it too! On my way to the market to buy me some apples! 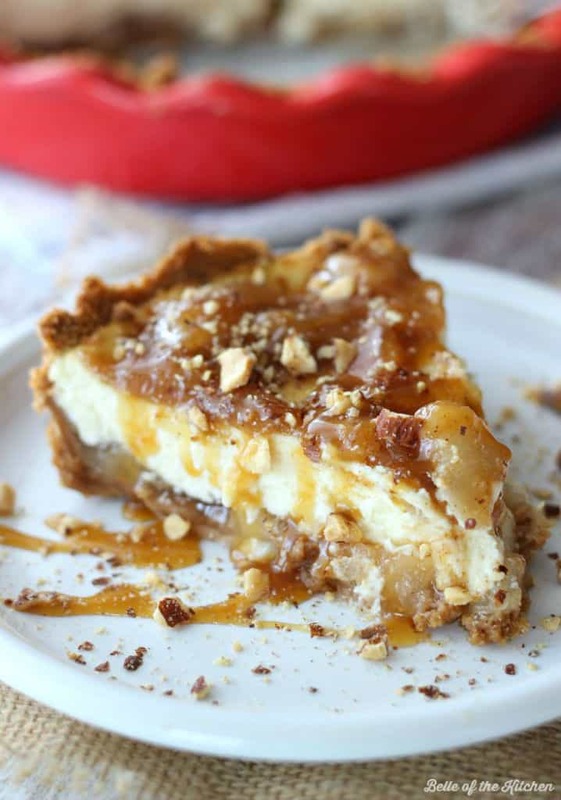 Have you ever tried making this without the sugar? Just curious because I usually eat unsweetened applesauce. 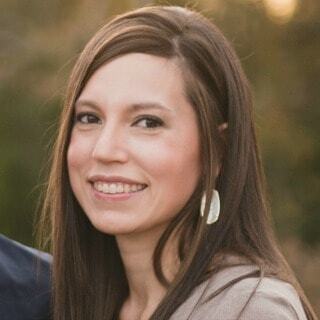 Hi Jessica! I haven’t tried it without the sugar. Let me know if you do though. 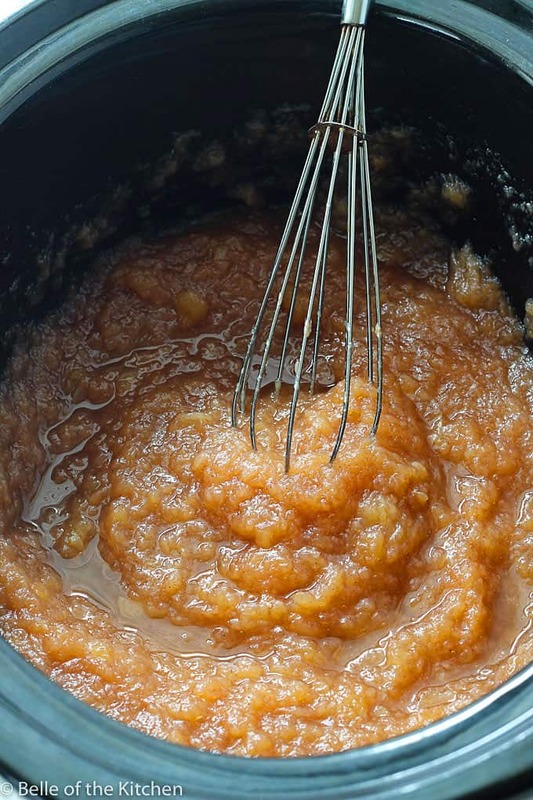 I always make my homemade applesauce without any sugar at all. It is naturally sweet and delicious. I leave the skin on to give it nice color and love it cooled down with yogurt. Our son loves apple sauce, I definitely need to try making this! slow cooker too makes it very easy it would seem. 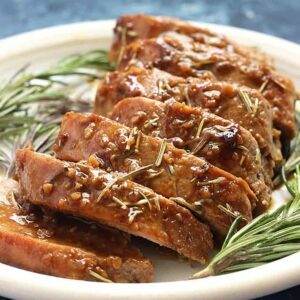 I love the ease of using a slow cooker instead of stove top this is perfect for me I am always way to busy to stand over a hot stove love applesauce! I think my husband would eat this whole pot & I love the smell of apples and cinnamon! This is exactly what I need. I have some apples I need to use. I love the fact I can let the crockpot do all the work. Cant wait to try this recipe!